Aluminum automobile body can greatly reduce the weight of car by the application in engine hatch covers, car door, rear covers and other outside covering parts. Product Feature: beautiful in appearance, remarkable in bake harden ability, high in safety coefficient. Sheet stretcher can release internal stress by transforming flexible deformation into plastic deformation. 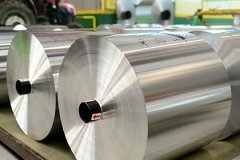 The processed aluminum plate mantains good processing properties. To accelerate the development and application of high-performed alloy aluminum in auyomobile industry, Haomei Al. passed ISO/TS16949:2009 quality management system certification issued by SGS.